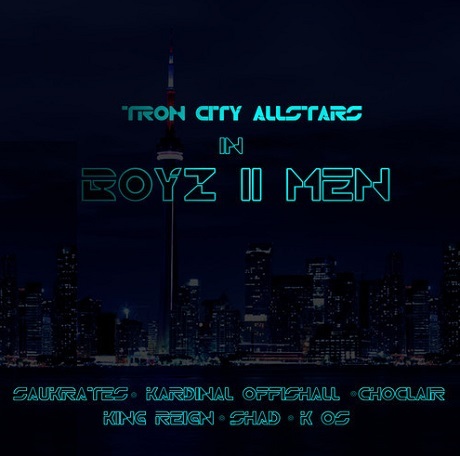 K-os, Saukrates, Kardinal Offishall, Choclair, King Reign and Shad "Boyz II Men (LouieCK dirty)"
A team of Canadian rappers including K-os, Shad and Saukrates have got together as the Tron City Allstars to deliver a boastful, banging crew track they call "Boyz II Men." As you'll find down below, the track takes on propulsive, synth-pulsating qualities and a vicious backbeat as the mic is passed between K-os, Saukrates, Kardinal Offishall, Choclair, King Reign and Shad. Laced into all of this up-north action is a left-field sample of Whitney Houston. If you've always loved these rappers, you can check the new collaborative track down below .